Hi loves! Happy Queensday ;-)! If you didn't know, I am Dutch, and every year we celebrate Queensday on April 30th, the birthday of former Queen Juliana. Today is a very special Queensday, as the current Queen Beatrix has stepped down and now Willem Alexander is our King. This also means this year is the last Queensday and next year it'll be Kingsday to celebrate on April 27th. To celebrate Queensday I wanted to do something with orange (our national color) and red, white and blue (the colors of the flag). Also I wanted to do something that was "me" and not just for celebrating this day. Freehand leopard print seemed fitting! I painted my nails with 2 coats of OPI A Roll In The Hague, a lovely deep tangerine shade (and an orange I'd almost wear besides days like these!) and used Revlon Copper Penny on all nails to create some spots. I did the side leopard on every nail but thumb and ring, these nails just got some random gold spots. I also added Essence Fame Fatal (red), OPI My Boyfriend Scales Walls (white) and OPI I Saw.. You Saw.. We Saw.. Warsaw (blue) to the thumb and ringfinger nail. A black polish and dotting tool was used for the outline, topcoat and I was done! Do you like these? Does your country have a king or queen? Looks great! And yes, you are in the middle of a huge royal affair now. I so enjoyed looking at all the photos of global royals (and others) in amazing gowns and tiaras/other jewelry bling in a huge way from the pre-inog. dinner Beatrix held at the museum on 4-29. I am almost done with my email now and going to look for the web news coverage from today's events - but will be hard to top the huge parade of amazing dresses and other finery of last night's event! I have only recently been getting into learning about tiaras and crowns - they have great history and your country has some of my real favs. I cannot help but think Prince Charles is jealous of your now King Wilhem-Alexandar and Queen Maxima. Charles is going to be very old by the time he takes over as King with not all that long to do his thing as King. I wish Beatrix health in her retirement and of course sure she will enjoy a lot more of her life doing what she wants to do now she won't have such a busy calendar to keep. Now it's on to King's day for you from here on out for a good long time I am sure! 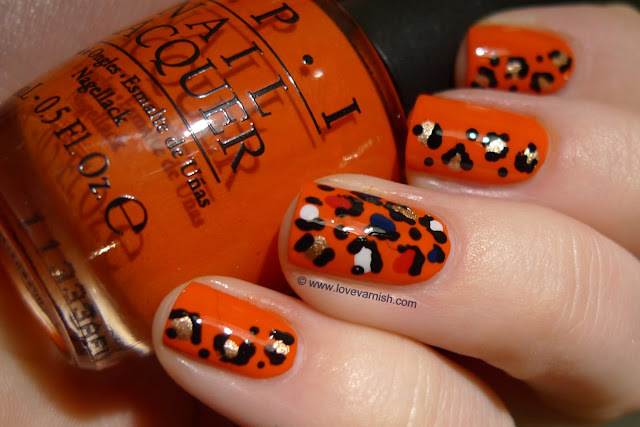 I love this mani it looks fantastic! What a gorgeous shade of orange :) I moved to Holland early this year so its the first Queen's day for me. I manicure decided to enjoy the orange festivities too! Hope you've had a good day celebrating! By the way, I also adore OP Roll In The Hague - it's my all time fav orange - just a great shade and my bottle is a wonderful formula. I wish I had it with me - (I am away for a few months on medical care). I want Roll In Hague on my toes right now which I cannot reach since I had surgery and hope I can go somewhere for a pedi this week if I am up to it - despite I hate to pay to have my toes done when typically I like doing my own best! This feels very Dutch to me, I love it! 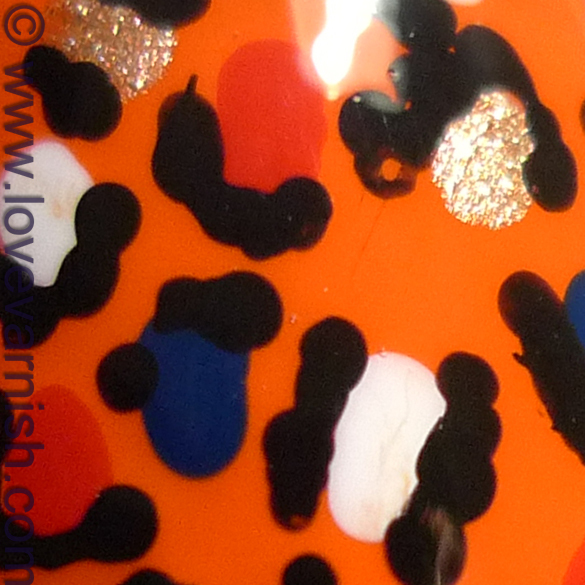 I really like the different colours in the leopard print, I'd never have thought to put them together but they work! I love it! 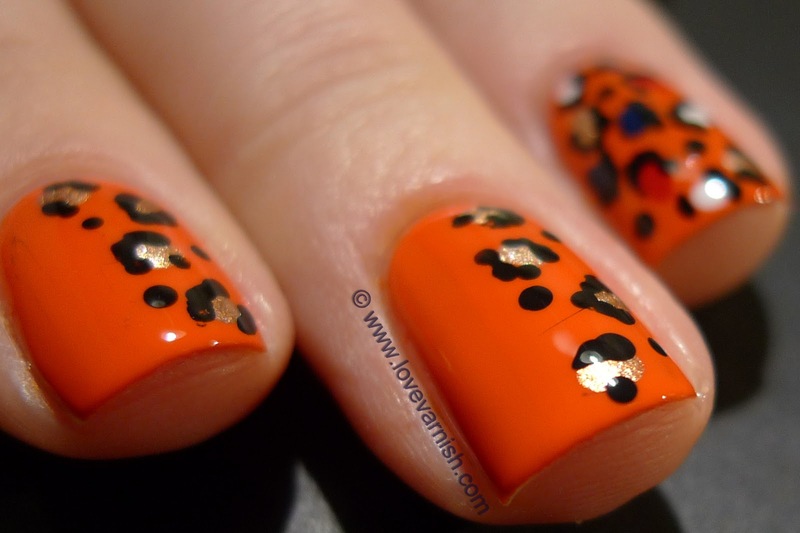 I guess Maxima could rock this as well :D I didn't do a queensday manicure myself. I feel so ignorant that I've never heard of Queensday. :( But yay for another day off of work, right?!? I think I will forever be jealous of your free hand leopard skills! When I was in high school, leopard print was kinda my thing. I wanted leopard everything! I would love to rock some leopard nails! Dank je wel :)! Zo leer je nog eens wat ;-). Haha ja het kan wat overweldigend zijn he ;-)? But thank you :D! I love the formula too! Actually I love the Holland collection to bits because of that. Hope your surgery went well. Thanks so much! Oh you did? For what reason (just curious ;-))? Hope you enjoyed your first Dutch festivity :). You do! It is stunning :). Heehee, how awesome would THAT be :D?! Ooooh don't be, we are SUCH a small small country it isn't weird you didn't know about it :). That's it, I am flying over to you to teach you :P. I have always loved leopard print so much, I even had leopard print All Stars (and I am wearing a leopard print scarf right now). I knew about your Queensday because a Dutch nailpolish seller I know usually sets discounts on April 30th :D haha, quite odd way to get aknowledged of foreign anniversaries! In Italy we do not have any king or queen but I think it would be way better for us if we had such a government, our political situation is an awful mess. I'm really ashamed of my country. BTW your leopard prints drive me crazy *__* I loooove them! I had a Jeep Wrangler years ago, and I had these awesome fuzzy leopard print seat covers. I had all sorts of leopard accessories in that truck. So much fun! It got lots of comments! You mean Nailpolish Fashion :)? She is great! Ah yes, Italy is having some *coughs* trouble *coughs* political. Our King does not have much influence though on our politics :). That sounds like an awesome car ♥. Yes, that's exactly her! :D Indeed, she is. She's a very kind person!